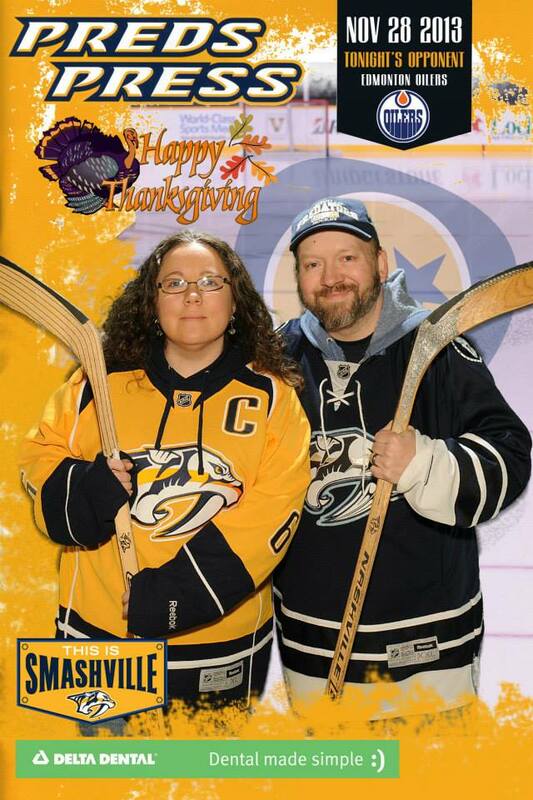 This Thanksgiving my wife Nicki and I to do a road trip up to SMASHVILLE to watch the Nashville Predators take on the Edmonton Oilers. It’s been a few years since I caught a Thanksgiving hockey game. The first one was at a Riverkings game back when they still played at the Mid-South Colosseum in Memphis back in the mid/late ’90s. That game I got to meet “Les Nessman”/Richard Sanders during their Thanksgiving Turkey Drop. No turkeys were dropped this time, but the teperature sure did! We stood around outside for a bit and listened to the marching band (who played the Batman theme from the ’60s TV show) and the live band who later played inside during intermission. 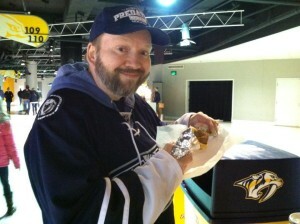 We did a bit of shopping at the outdoor kiosk and got a good deal on some Preds tees- $5.00 each, even on my XXL one. Once the doors opened to the arena we hurried inside. We were dressed in layers but it was nice to be indoors. Did a bit more shopping at another kiosk by the escalators. Picked up a Santa hat for Nicki, a Thanksgiving game puck, and a couple stocking stuffers for Christmas. That’s Nicki in her new player jersey (an anniversary present) with her new hat and favorite player- #6 Shea Weber. Delta Dental was sponsoring free fan photos before the game so Nicki and I had our pic taken. We each got a 4″x6″ souvenir photo to take home. We’ve gotten a few at other games, too. They’ve got a great green screen set up and are very quick. We had our photo taken and in our hands in just a minute or so. 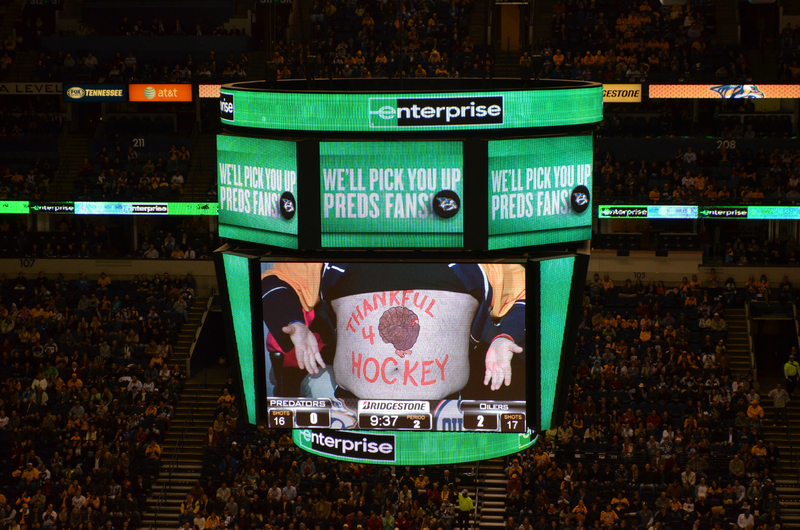 Thanks to the Preds, Delta Dental, and Schenk Photography for our Thanksgiving treat. We walked around the concourse some more and found another kiosk that had a GNASH Christmas ornament and some Preds guitar picks. 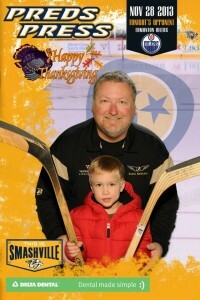 We then made our way to the Nashville Predators Foundation booth. Lots of autographed items were in their silent auction. 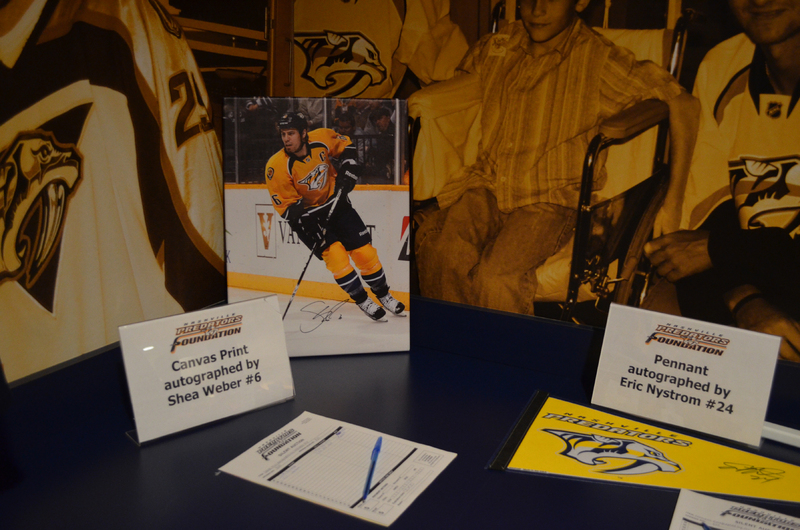 They also had several wrapped “mystery pucks” signed by Preds players for $25.00 each. 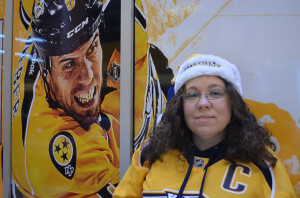 Nicki picked up autographed #7 Matt Cullen and #57 Gabriel Bourque pucks- two players she didn’t have. 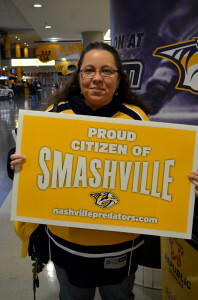 She also bought a Preds 2014 calendar. 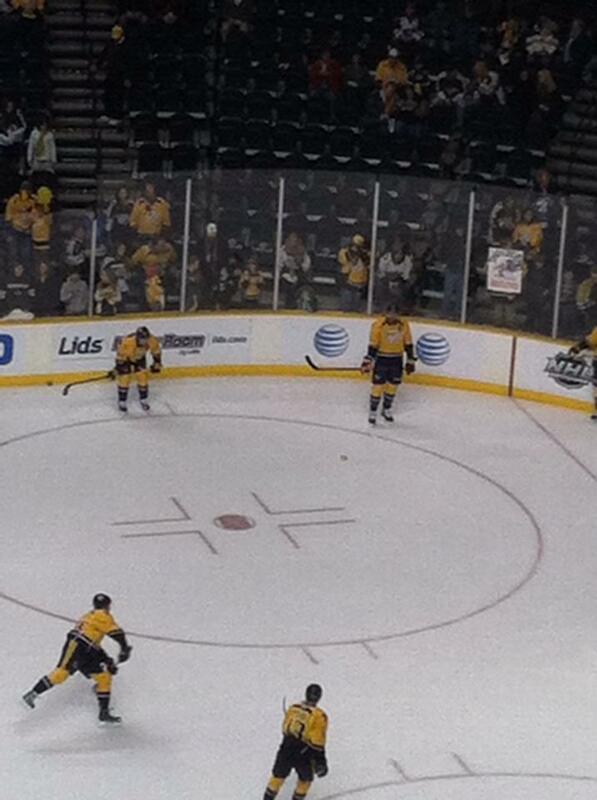 There was a special 50% off sale starting at the 2nd intermission but we passed on it. 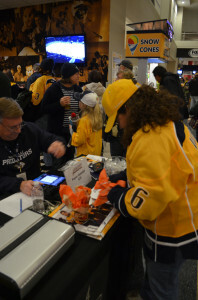 We already had a bag full of Preds goodies to take home with us, and the line after the game was still reeeeaaaaalllllly long. I’m sure we’ll do more shopping in the pro-store the next trip. Before the game started we decide to have Thanksgiving dinner. Nicki and I each had a chicken and waffle sandwich– just like the pilgrims! Oh, speaking of Southaven, we ran into one of my old high school buddies- Jay Barnes. He was on duty as an EMT at that night’s game and got to bring some of his family along. Good to catch up with him. After dinner Nicki headed down to the ice to take some shots of the team warming up while I went to find our seats. 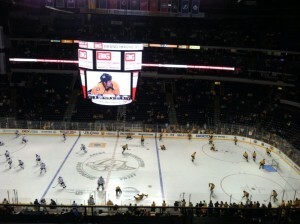 We were up a bit, but just off center ice- our normal seats. 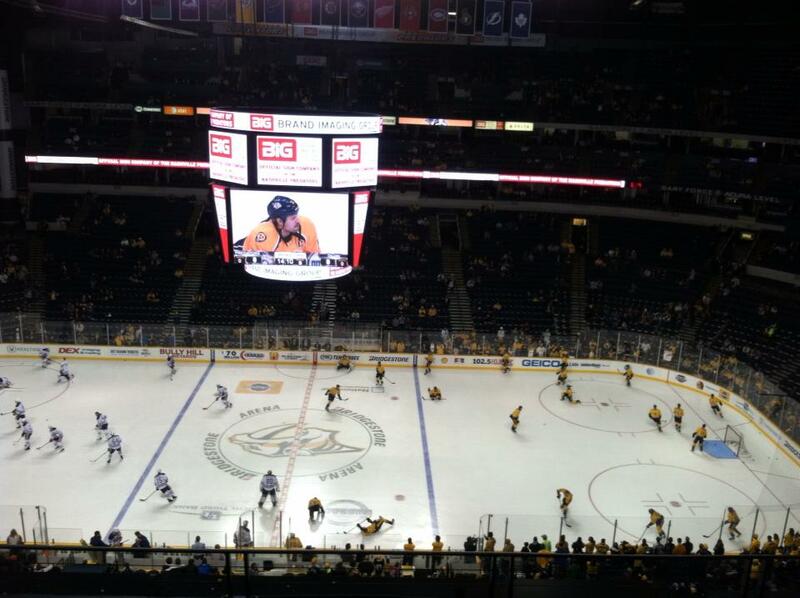 I like them because we can see the whole rink. 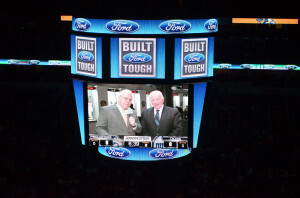 I’ve had seats down on the ice or behind the players at other hockey games and ended up not seeing a lot of the action. 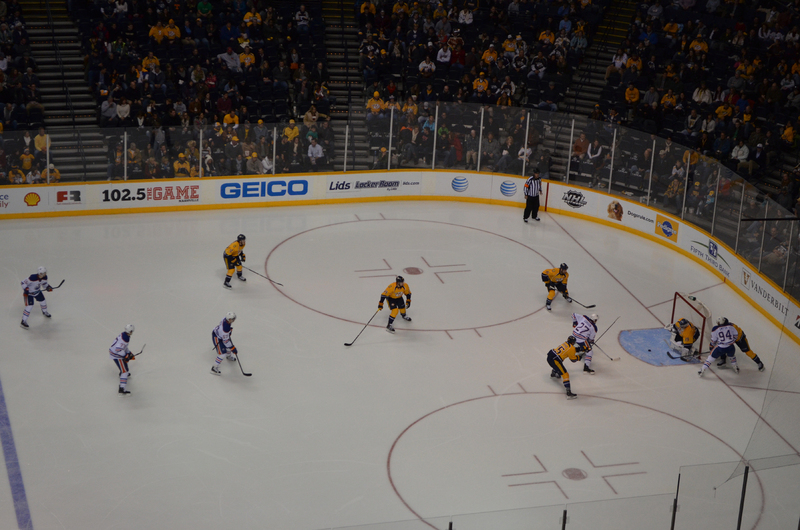 Nicki found a great spot near the Predators’ goalie end and got some great action shots of the players practicing shooting goals. 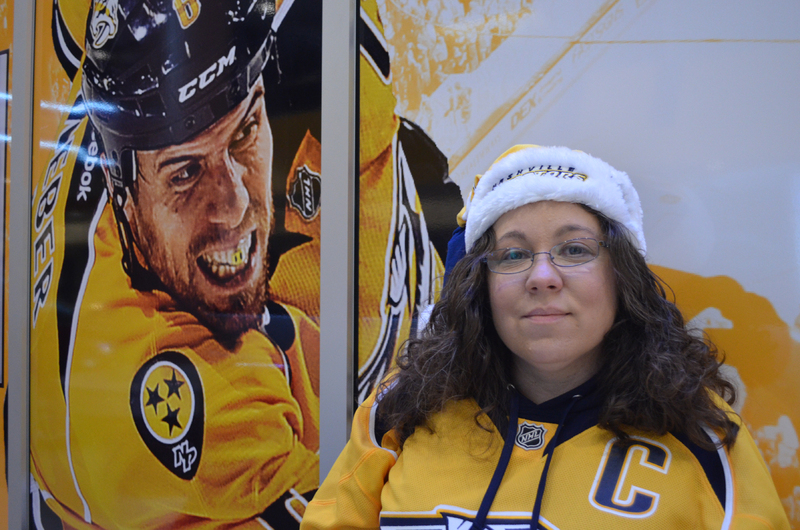 Hopefully she’ll be posting some of those on one of her sites– but look who ended up skating and standing in front of her… #6 captain Shea Weber! It’s always weird to watch a Preds game and not hear Pete Weber and Terry Crisp call the game- we’re so used to watching the games at home on our TV, but we did get to see the two on the Preds’ big screen just before the game started. 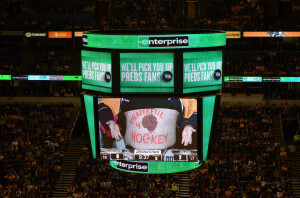 The game did not go well for the Predators (you can see all of the stats here). 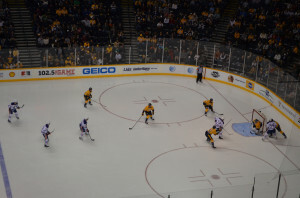 They not only lost 3-0 (one goal scored on an empty net- ugh! 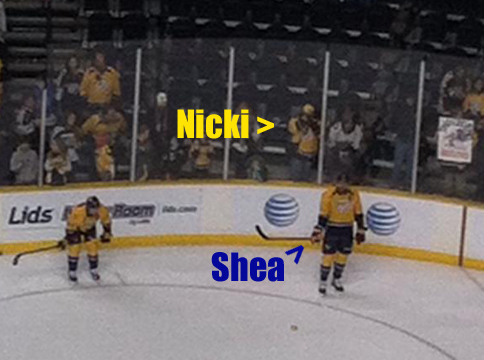 ), but Shea got injured on one play late in the game and had to leave the ice. He was struck in the face by a puck (OUCH! ), or as the NHL calls it, “suffered an upper body injury“. 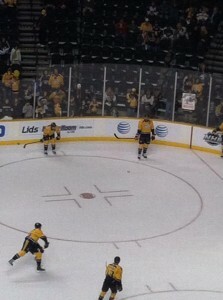 My favorite player, goalie #35 Pekka Rinne, is currently out due to hip surgery. Hoping both players have speedy recoveries! 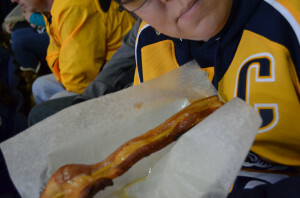 Some good news, during the second intermission Nicki was able to snag the last bacon on a stick the concession stand had! 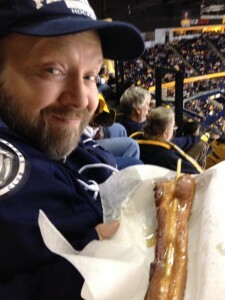 Food is always better on a stick, or fried, or deep fried, or deep fried on a stick! The only thing that would have made it better is a bit of pepper on it…and more bacon! Mmmm…bacon! 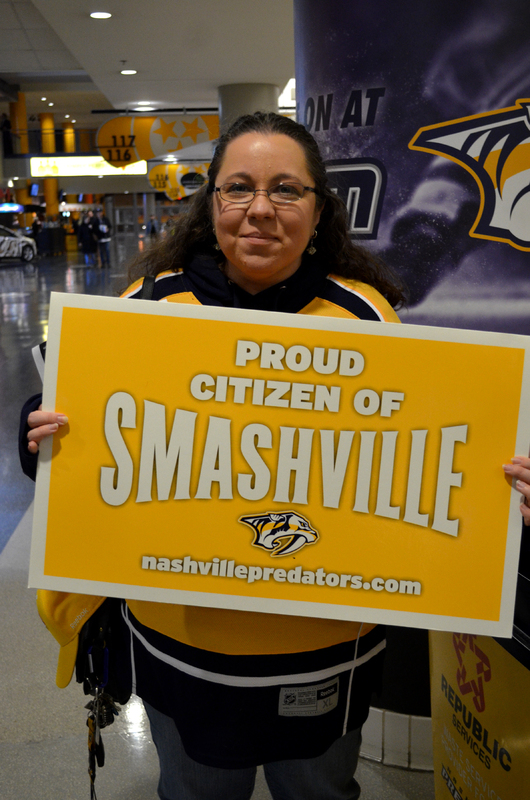 Despite the loss to the Oilers we had a great time being back in SMASHVILLE, and look forward to catching another game soon. The next morning we checked out of our hotel and headed back across town to Noshville for breakfast. 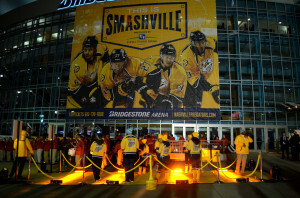 It’s not too far from Bridgestone Arena and one of our favorite places in Nashville to eat. Normally there’s a bit of a wait for breakfast. 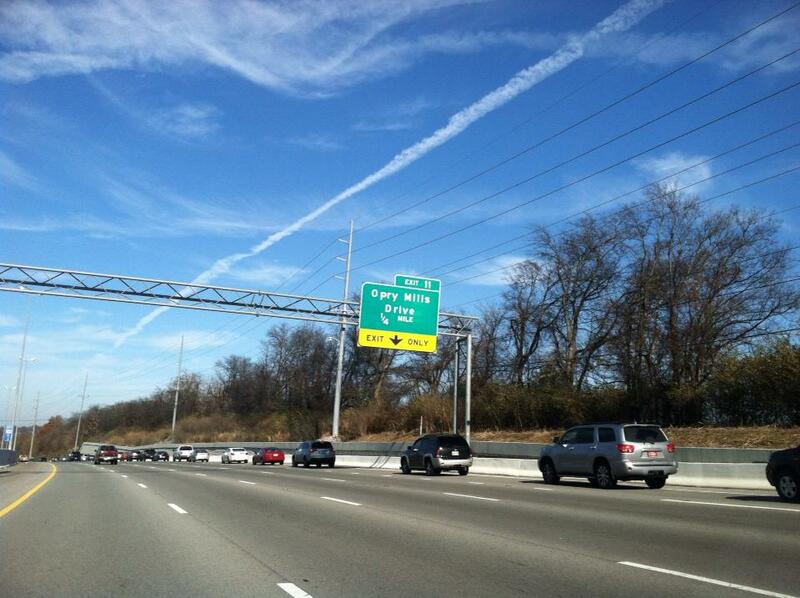 We usually hit it on a Saturday or Sunday morning, but we seemed to time it just right on Friday. We got a parking spot up front and were seated immediately after walking in. I got the corned beef hash, scrambled eggs, fruit cup, orange juice, and bagel. Don’t remember what Nicki had- I was too busy enjoying my breakfast to notice. After we were done I asked for one of their pickles. 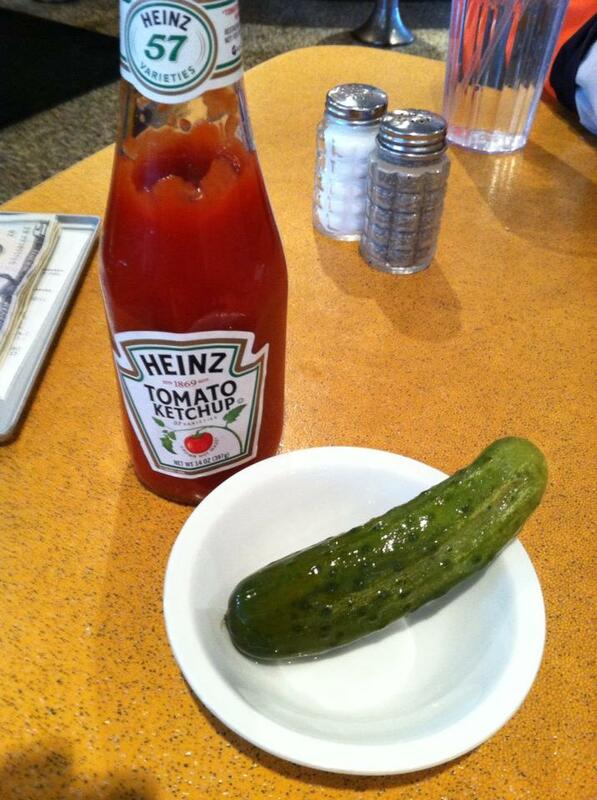 It’s a kosher dill- but not sour like I’m used to getting from the supermarket. It has more of a garlic and salt flavor that I haven’t had in a pickle before and is a nice change. I grew up with both sets of grandparents making their own pickles- the Workmans made dill pickles, and the Morgans made bread & butter sweet pickles. I really enjoyed gardening with my MaMaw and Pop Morgan in Memphis, and enjoying a pickle and a soda in my Grandma and Grandpa Workman‘s ceramic shop in northern Utah. Love me some pickles! And ketchup..! 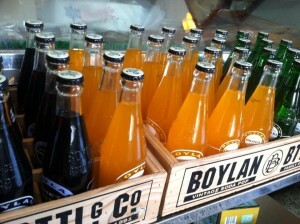 I have been wanting to try their bottled sodas ever since I first ate at Noshville, but always forget to pick up some. This time I got a bottle of grape, orange (which I’m enjoying as I type this), and a couple bottles of root beer. They’re quite tasty, but I have to admit they made me miss getting a grape Nehi or Sun-Rise soda when I was growing up- those will always be my favorite. 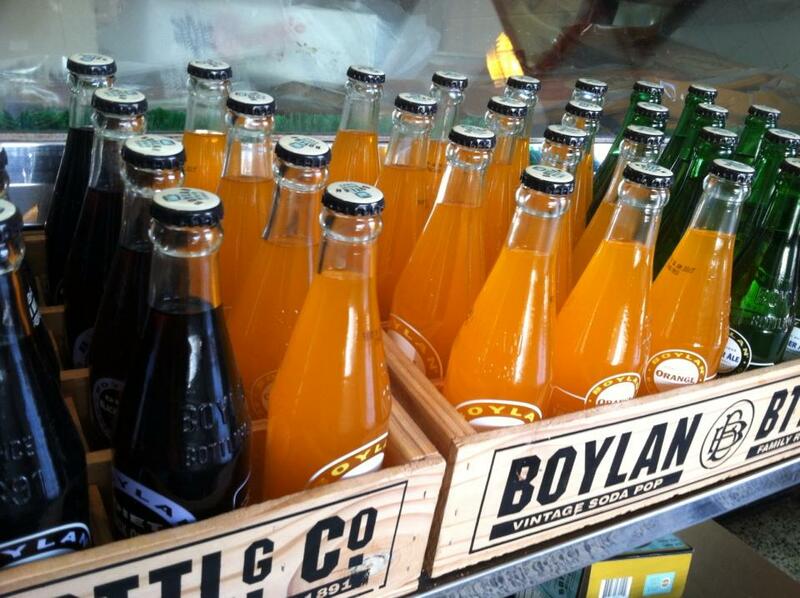 I really like A&W and IBC root beer, so I’m looking forward to trying the Boylan ones this weekend. We were surprised at how light the traffic in Nashville was on Thursday and Friday, even as we passed the Opry Mills Mall exit. “Shopryland” was packed as usual, but we decided we’d shop there when it wasn’t “Black Friday”. Nicki had been reading news stories about all the fights and more going on around the country- especially at Walmarts in Tennessee, so we avoided Black Friday sales like the Black Plague! 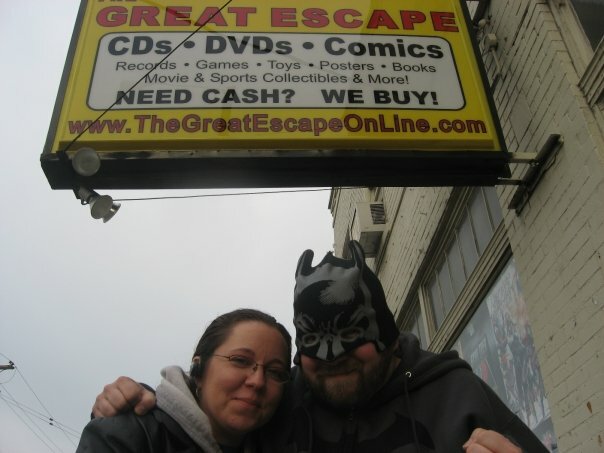 We figured it would be safe to slide by Rick’s Comic City instead. The fanboys and fangirls were all well behaved and I picked up a couple comics, a Harry Potter stocking stuffer for Nicki, and several ’60s Batman buttons for me. Saw some of the new DC Bombshell statues and an Adam Hughes Harley Quinn Cover Girls statue I don’t have (but want, hint-hint!). Also saw a couple things I might have to pick up for Nicki on our next trip if I need some more stocking stuffers (her stocking is about 3-4ft tall). 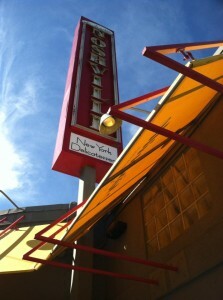 We usually hit Rick’s before or after eating at McNamara’s Irish Pub just up the street, but we were both still full from breakfast at Noshville! 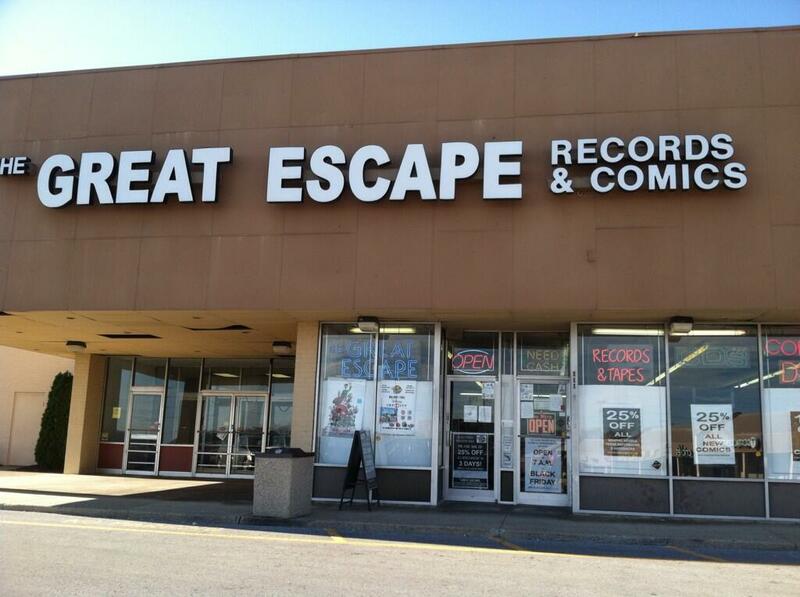 I always try to hit The Great Escape when I’m in Nashville, too. I really loved stopping by the old location off Broadway in the Vandy area (near Noshville), but they merged it with the Charlotte Avenue location a couple years ago due to rent increases in that area. 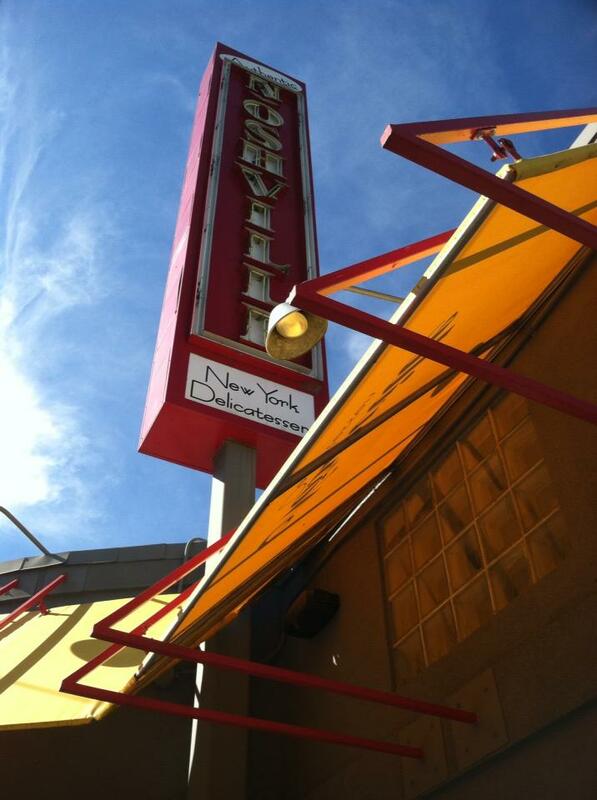 It had been there for 33 years and was one of the first places in Nashville I learned how to get to. Since we hadn’t been to the Madison one before we went to look for it. It’s smaller than their other locations but Nicki found a Doctor Who comic she was missing, and I found a few more Christmas presents for Nicki– which ended up being 25% off. They opened up at 7:30am for their Black Friday sale, and were still busy while we were there around 1-2pm. And like at Rick’s, the customers were all well behaved. 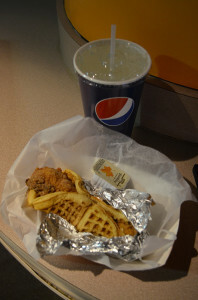 One of our other usual stops while in Nashville or Murfreesboro is Sport Seasons. 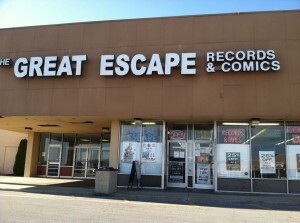 This time we hit the new location in Cool Springs. We didn’t realize the store had changed locations so when we saw “WE’VE MOVED” signs in the dark and empty windows we got a bit sad. Luckily it was still in the same shopping center and just a few doors down from it’s previous address. 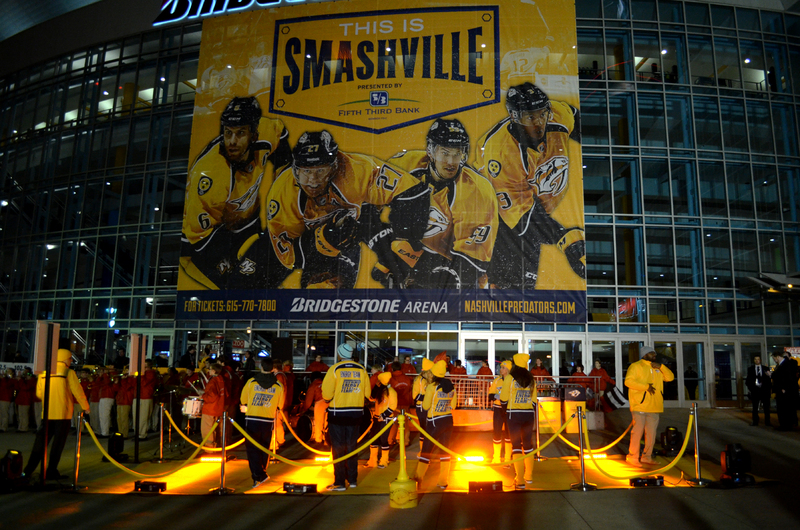 Nice shop, lots of Preds and Titans merch (and even some Rams and Yankees items). If/when Nicki and I get a sports bar in our house we could go nuts there! 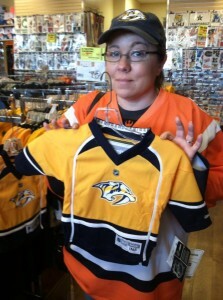 I did get a bit worried when Nicki found a cute kids Preds hockey jersey and baby booties. Thought I might have to take her to Walmart for a dose of “screaming kid birth control“- STAT! 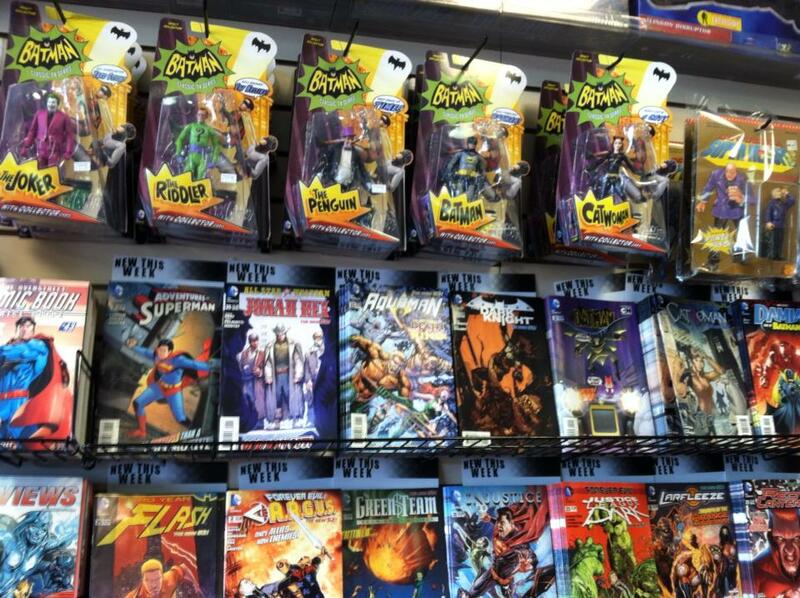 I was told if we have kids I lose my Batcave…NOOOOO!!! 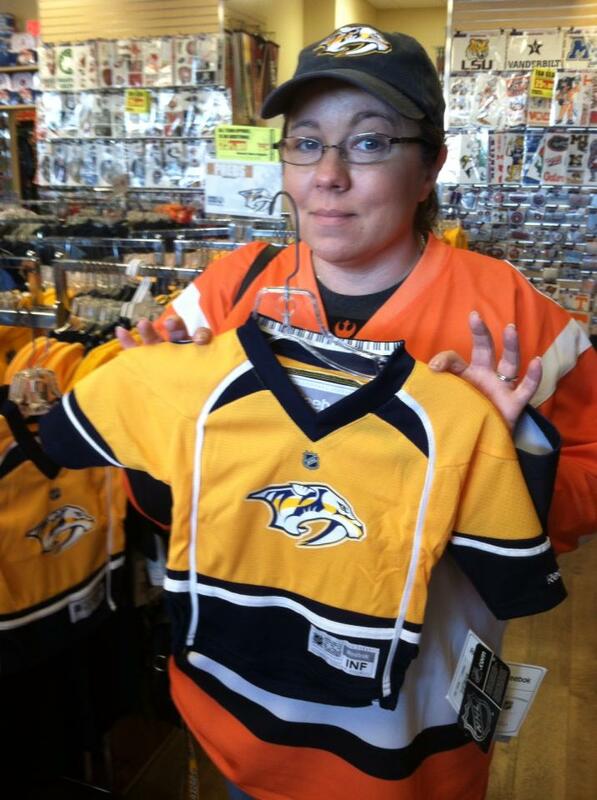 The crisis was averted and she actually ended up buying me an early Christmas present- a Pekka Rinne player jersey! We didn’t see one in my size on the rack, but as we were leaving we saw more on display in the window and went back in to check. It was already on sale and she ended up getting an additional 25% off which made it half off…she SCORES! With the last of our purchases in the trunk we headed back home. I was really afraid the weather was going to be horrible during the trip up and back or that the I-40 road construction I ran into on my Wizard World day trip would still be going on, but other than it being cold the two days it was a really nice and quick drive. Hope you all had a Happy Thanksgiving and survived Black Friday! Glad you had a great time in Nashville. Very happy you made the trip there and back safely. Love you both.